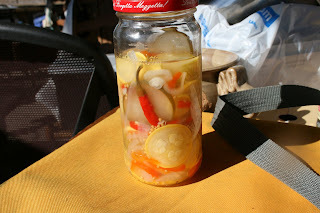 Barn Appétit: Squash Pickles---Who wants this recipe? I do! I do! As soon as I can get my hands on the recipe, I will post it here. They are delicious, not too hot, not too sweet, jussssst right! Tom Jeffers is a co-worker and friend who shares my interest in all the important things: grand-babies, family, cooking, growing veggies, just to name a few. Okay Tom, if you are reading this, give up the recipe-----now! Dissolve salt in 3 quarts water in large bowl; add squash. Submerge squash in water, using a plate to hold slices down; cover and let stand 3 hours. Drain and set aside.